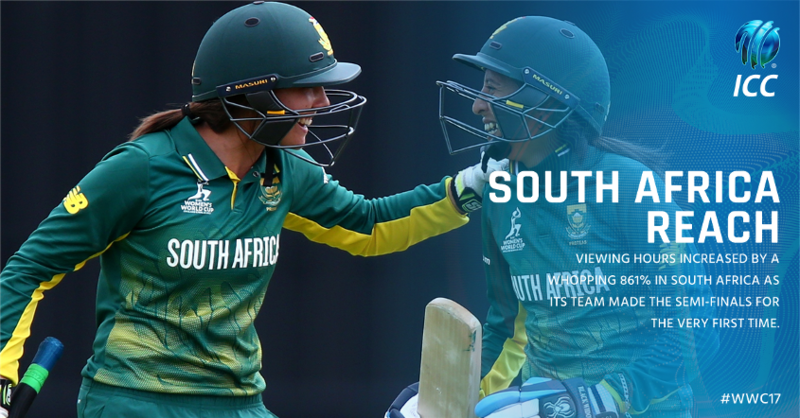 More than 180 million people around the world are estimated to have watched this summer’s ICC Women’s World Cup and there was an almost 300% increase in viewing hours* in comparison to the last edition in 2013. There was significant growth in audiences in all territories, but particularly impressive was an eight-fold increase in viewing hours in South Africa and a huge increase in viewers in India, particularly in rural areas, since 2013. The ICC’s decision to ensure that every match was available for viewing either on television or via live-streaming as part of its commitment to the global growth of the women’s game has paid dividends. An extraordinary 156 million people viewed the event in India, of which 80 million was rural reach and 126 million were for the final alone. India’s fine performances contributed to a 500% increase in viewing hours in their country. 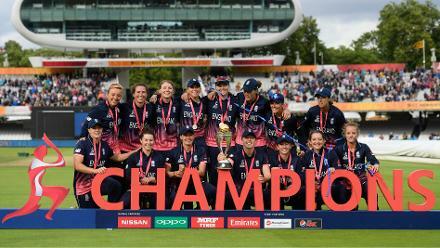 In the United Kingdom the World Cup final attracted most viewers for any televised cricket this summer, while the entire event saw a 300% increase in terms of viewing hours compared to last time. 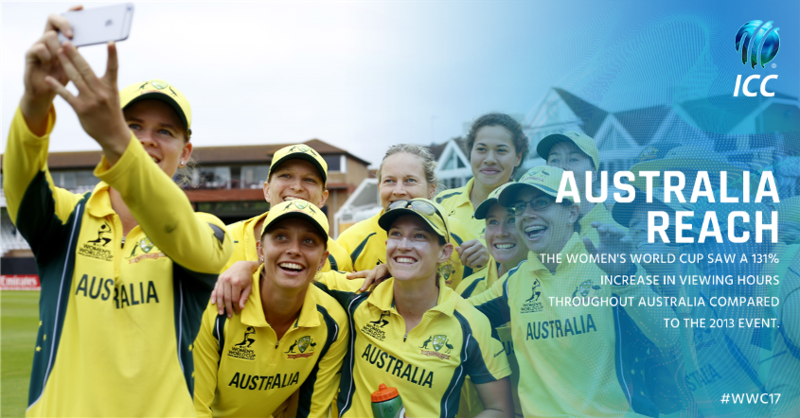 Similarly, there has been a 131% increase in viewing hours in Australia while it is a whopping 861% in South Africa after its team reached the semifinals for the first time. 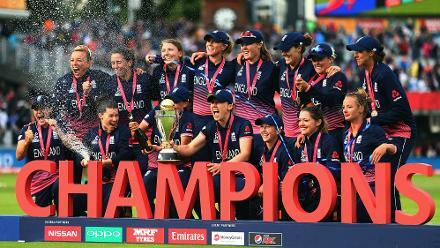 ICC Chief Executive David Richardson said: “We are absolutely delighted with the impact the Women’s World Cup has had. 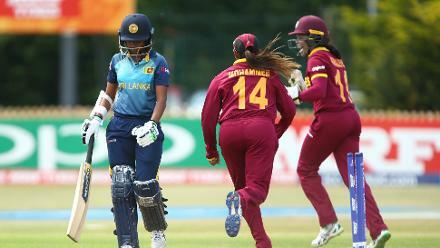 Instinctively we felt that the time was right to invest in women’s cricket and take it to the widest possible audience to accelerate the growth of the game and these numbers have confirmed that. 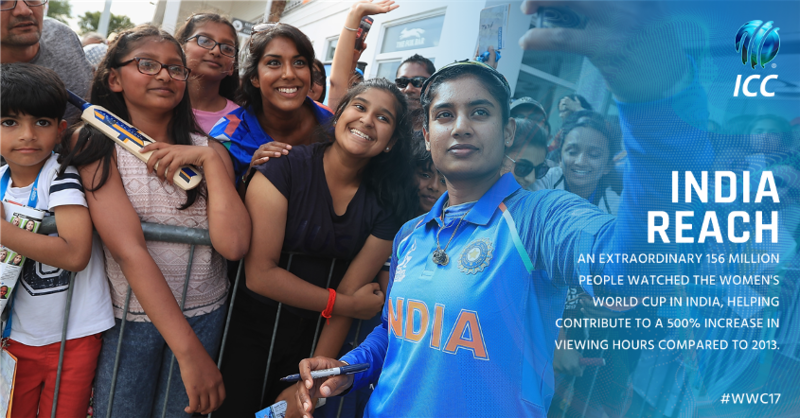 There were 100 million video views across ICC digital platforms and social media channels with one billion impressions and 67 million unique users on Facebook via posts on ICC’s official pages - @cricketworldcup and @icc. 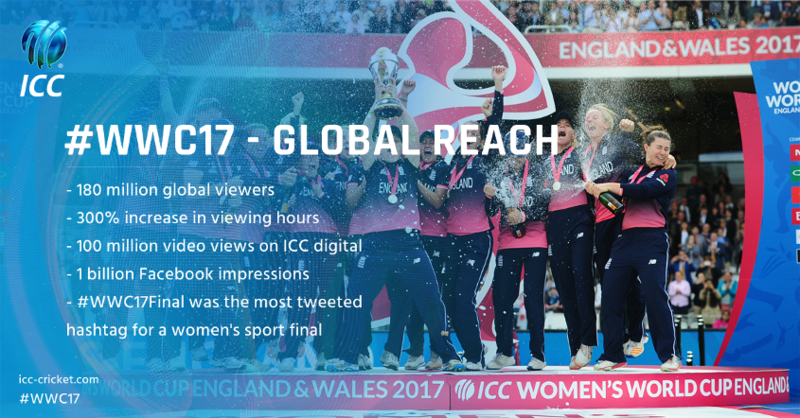 On Twitter, the hashtag #WWC17 was the most tweeted hashtag for women’s sport in 2017 with one million tweets, which is a 24-time increase over the 2013 edition. The hashtag #WWC17Final was the most tweeted hashtag ever for a women’s sports final while the launch of the first ever captain ‘emojis’ for a country versus country sporting event was a big success with a 875-fold jump in tweets using captains’ hashtags in comparison to the 2013 event. The event also attracted almost 50,000 articles in print and online across more than 100 countries for the four week period of the event. India leading the list with close to 16,000 articles, the United Kingdom second at 14,000 and Australia third with close to 9,000 articles. The United States of America was fourth at 4,700 while South Africa had 1,368 articles used in all.